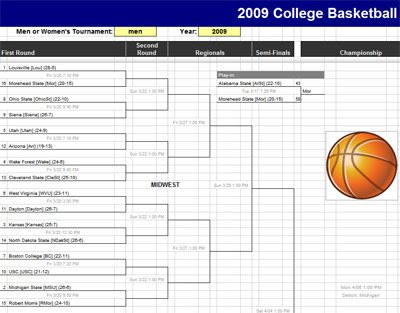 The first round of the 2009 NCAA Division I men's college basketball tournament starts tomorrow. For many of us in the U.S., it's a time when we root for our favorite college teams and engage in some friendly competition with co-workers and college buddies to see who's going to win the National Championship in Detroit. In preparation for this year's tournament, I used my 20% project time to create the tournament bracket template above, all within a Google Docs spreadsheet. To make this spreadsheet work, I created a GoogleTournament function that lets you look up a plethora of information about the NCAA tournament including team names, records, seeds, scores, game times and even the location of a game. Every time you check out the spreadsheet (and if you're like most college basketball fans - multiple times each day) you'll see the latest results. Since you can add collaborators to your spreadsheet, it's easy to engage in some friendly rivalry (i.e. trash talk) right within the spreadsheet. The template includes 10 blank brackets that each of your friends can fill out. No need to print out and fill-in blank paper brackets. There's one sheet that shows whose picks are the best. If you are brave enough to share your picks with the world, you can publish your sheet or the entire spreadsheet. When you're in a fan forum discussing the tournament, you can just refer to the published spreadsheet to show off your picks. Not satisfied with my basic spreadsheet? Create your own using the GoogleTournament function.